Rarely do they have Lego on sale nor do their coupons work, but when they do, it should be posted here. Members were sent an extra 20% coupon which can be used on the following selected "FATHER'S DAY" sets. The Architecture set is already 20% off. With the extra coupon, it comes down to around $95. Lego Build Events at BN today nationwide starting around 4:00 p.m.
Any idea what the build is? ^ It wasn't a specific build at the one I went to. Just free build with bins of pieces. yep free builds with a chart of suggestions. They let everyone in the family build which was nice....my local Barnes even featured what I left on the table in their facebook photo. 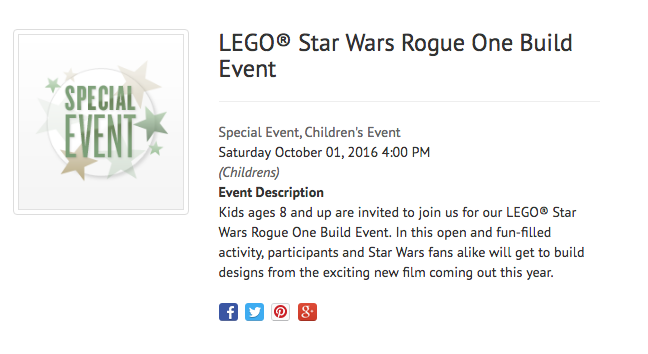 Another Build Event at BN: Star Wars Rogue One related? ^Stopped by the event today with the kids. It wasn't a make and take, it was just a few crude builds with guides similar to the Cap Mosaic from TRU a few months ago. Some of the guides were of Chewie, R2, BB-8, the Death Star, and the heads of an Ewok, Stormie and Boba Fett. No, they just broke the sets apart after the models were built and left all the bricks there. It looks like the TRU Bricktober events are going to be the same way with the exception of the Frankenstein build on the fourth week. There weren't any special parts aside from a few plates, they were mostly basic bricks. why even include a Lego set when they're usually excluded? I hope someone can convince an associate to consider the set eligible for discount as it is pictured on the ad. Checked the Barnes and Noble store near the University of Rochester campus, there was a small LEGO display in plain sight, but no price signs, let alone sale signs. Just tried to buy the Friends Roller Coaster for my daughter for Christmas - with the 30% off would be $10 cheaper than Amazon current price (and this is one of the more expensive sets available under the deal). Despite it saying the discount would appear at checkout, it didn't - tested other sets also, including the pictured ones, and none worked. So an online chat with their support team resulted in me placing the order and them going in and updating it after the fact, while we were still on the chat - so I got the discount, but it wasn't super easy. I was hoping to get some sets, no luck. Looks like the discount is adding to sets now when you go to checkout. Yup...many sets 30% off. Biggest set I see that it applies to is the ninjago temple of airjitzu at $140. Tempted to another one. The details on the website say the offer runs until 2:59 AM Eastern Time on the 11th (this coming Tuesday). All I really want from #41131 is the 2 new minidolls; a bunch of little models is a problem with advent calendar sets in general (and has been said of certain other sets). That and a $4.95 set would get me free shipping, but I'll pass. I don't have much to spend and I'd rather get some sets on sale locally. B&N seems to have everything listed at retail, rather than 30% on top of an existing discount. Barnesandnoble.com has 20% off Elves and Friends. 50 miles away from me, so I cannot get there, did not call because I would not want to tip off the staff, just in case it is real. If somebody is close by this could be a real steal. Store near me says the same $ 2.00, but when it was half price they said they didn't have it. So either inventory is screwed or some employee is/was waiting for it to go super cheap. Yes, one near me! Thanks. I'll let you know in a hour or so!! Lol, please, nobody call!! Didn't mean to post phone numbers! Bought #ISBN1465453024 365 Things to Do with LEGO Bricks book for $15 at a B&N in Katy, TX. It was by the entrance on a pile of "literature for kids" (or something like that) among other books. Saw that at our store too...any good? Looks like it might be fun to do with my kids or my students at school. I browsed through it and I like it. It does not have instructions nor list of parts; it's more of an "ideas" book with hints/techniques highlighted to help out. Includes a nice variety of models, from brick-built animals, to scenes, to games. For $15 I think it's a great deal. B&N has 25% off Ninjago sets. There is also 15% off a $50 order thru Nov 9th, but it can't be used for Ninjago sale items. fine print says the 15% off coupon not valid on all LEGO products. Stopped in my local Barnes and Noble today and was pleasantly surprised to see last years Christmas vingette 40125 on the shelf.... seeemed a bit odd. Still 9.99. Black Friday special, buy one lego get one 50% off, also there is a 30% off any item but if you dig deep enough, it excludes Legos. #41131 Friends Advent Calendar is 25% off. I'm not seeing anything else on sale before the BOGO 50% off. I don't want 2 41131, and I don't see anything else to get with it. B&N is having a buy one, get one 50% off that is working on Lego. Unfortunately the 30% off single item coupon does not work, as expected. The 30% coupon says excludes LEGO. The buy one get one 50% does not exclude LEGO. The 30% does work, I tried it on the Millennium Falcon and it came out to $104.97 plus tax. Too bad the selection is rather pitiful on the larger sets, seems nearly everything is sold by marketplace/3rd party. Is the 30% just a single code, or does it vary by member? It's a cyber monday thing. This offer is valid at BN.com from November 28, 2016 at 12:01 am to November 29, 2016 at 2:59 am Eastern Time, while supplies last. Get 30% Off (1) qualifying item from our Toys & Games and Hobbies & Collectibles Department during our “Cyber Monday Sale - 30% Off One Item” promotion. 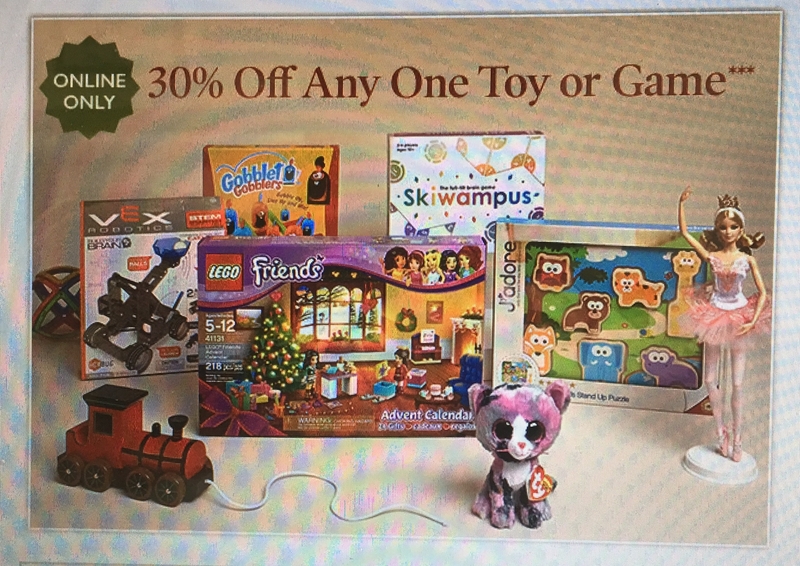 Simply look for the “Cyber Monday Sale - 30% Off One Item” message icon to identify eligible items on BN.com. In order to take advantage of this offer, you must place the qualifying Toys & Games or Hobby & Collectible item in your BN.com Shopping Bag. Your credit will appear at Checkout. If no ""List Price"" displays on the item's product page, the discount will be applied to the “BN.com Price."" If ""List Price"" displays on the item's product page and the current ""BN.com Price"" provides greater savings than this offer price, then the ""BN.com Price"" will apply. 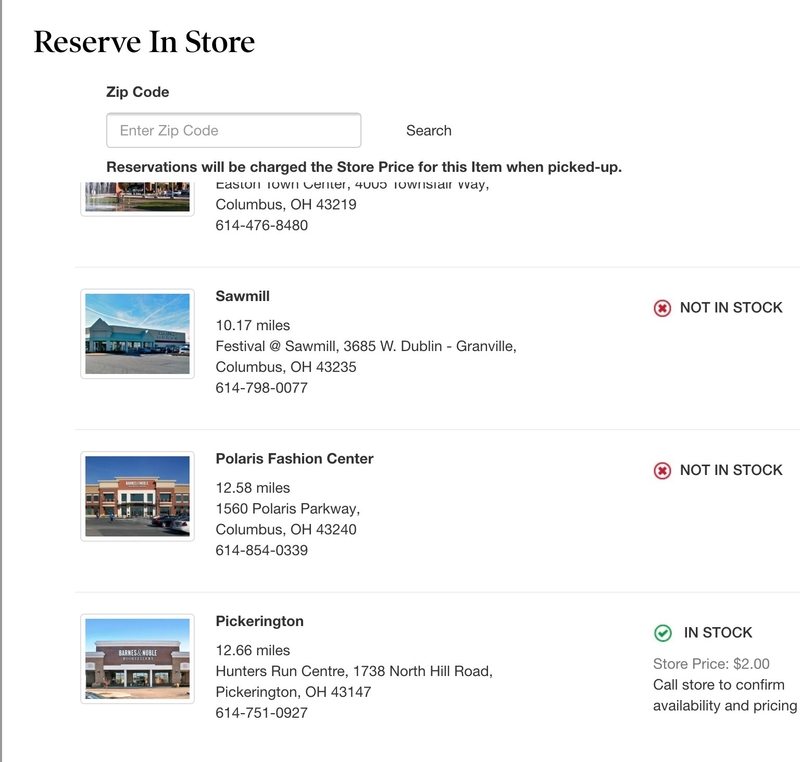 The ""BN.com Price"" is the price at Checkout before taxes, shipping and handling charges, and discounts are applied. Additional Rules Governing this Offer: This offer is (i) not redeemable for cash or cash equivalents (including Gift Cards and eGift Cards); (ii) not valid on past or pre-ordered purchases; (iii) not eligible for purchases of any products other than select Toys & Games and Hobbies & Collectibles items; (iv) not valid on products marked as not eligible for ""coupons or promotional discounts""; (v) not valid on applicable sales tax, or shipping or handling expenses; (vi) not valid on purchases made from third parties accessible from the BN.com website (e.g., used books, etc. ); (vii) may not be combined with any coupon or discount promotion; and (viii) may not be combined with the Educator program discount. This offer is not valid at Barnes & Noble retail bookstores or at Barnes & Noble College bookstores or websites. Returns or cancellations may result in forfeiture of discounts applied at the time an order is placed and you will be responsible to pay any such adjustments; we reserve the right to charge your credit card or debit your Gift Card in the amount of such adjustments. Barnes & Noble is not responsible for typographical or pictorial errors. This offer is subject to change or discontinuation without notice; we will, however, honor properly placed orders with valid methods of payment with sufficient funds placed prior to such change or discontinuation. Void where prohibited by law." This is filtered for NEWEST > OLDEST; 40 items per page. 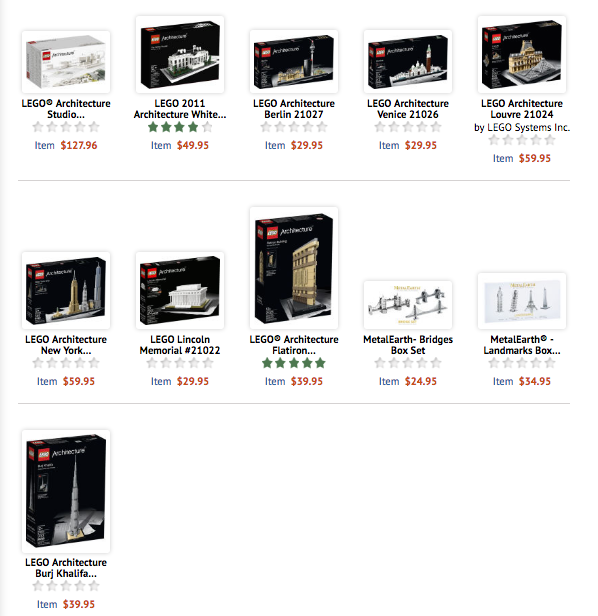 Looks like just about all the Lego sets on the web site are 20% off right now. Except Architecture. This appears to be online only. At least at the stores here in Minneapolis, there are currently a lot of sets at 30% off, including Star Wars, Marvel, and City sets. If you have a B&N membership, you get an extra 10% off the clearance price (for a total of 37% off). I even found 60004 Fire Station, which looks like it was retired more than a year ago! Check your local B&N for correct dates and times. Saturday January 28, 2017 2:00 PM In January and continuing February 25th and March 11th, celebrate the release of The LEGO® Batman Movie. At each event, kids can collect two limited edition trading cards (while supplies last) featuring characters from the movie. The cards collected at all three events will unveil a special scene. Enjoy giveaways, make and play themed moments with LEGO® bricks and blocks plus much more. I found a box of Batman CMF's yesterday at my local B&N. No LEGO in clearance but there are 30% off stickers on some City and Nexo Knights sets. Grabbed a couple 30% discounted sets today (#60080, #70316) with 10% member discount on top of that. They also have the new architecture sets, so I had to get my #21033 Chicago. They still had a #21014 Villa Savoye on the shelf, but I already have two of those. Does B & N still have the 20% or 30% off coupons?